Vcc is constantly monitored for an out-of-tolerance condition. 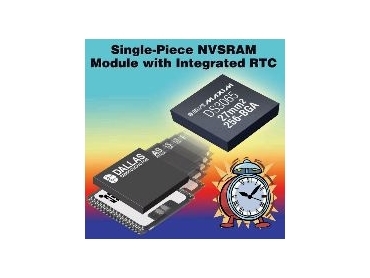 DALLAS Semiconductor, represented in Australia by Arrow Electronics , has released a single-piece, surface-mountable, nonvolatile SRAM (NVSRAM) module with an integrated real-time clock (RTC). The DS3030/DS3045/DS3050/DS3065 provide an integrated and convenient way to protect mission-critical data from unexpected power loss. Packaged in a 27mm x 27mm, 256-ball BGA, these parts are completely sealed from the outside environment. They also contain a reflowable battery. Due to integrated intelligent circuitry, the Vcc is constantly monitored for an out-of-tolerance condition. When such a condition occurs the lithium battery is automatically switched on and write protection is unconditionally enabled to prevent data corruption. The RTC in the modules contains a clock/calendar with an RTC alarm, a watchdog timer, a battery monitor and a power monitor. RTC registers contain century, year, month, date, day, hours, minutes and seconds data in a 24-hour BCD format. Corrections for day of the month and leap year are made automatically. There is no limit to the number of write cycles that can be executed with the memory modules and no additional support circuitry is required for microprocessor interfacing. The devices can be used in place of SRAM, EEPROM or flash components. The 3.3V modules are available in densities from 32k x 8 bits to 1M x 8 bits, all having the same footprint and pinout. This enables the product to grow in density while still keeping the same footprint. Handling the DS3030/DS3045/DS3050/DS3065 modules in a standard assembly processes is simple and convenient. The parts can be picked and placed from their shipping trays, using existing machines. They are compatible with standard SMT processes and withstand reflow temperatures of between -5°C and 225°C for 30 seconds. After reflow the modules can be washed in an water-based cleaning solution with no special precautions.